Is it really hard to shop for the best heated socks? The truth is, you have overflowing choices on market today. It would be doubly hard to choose which of these socks offer thermal protection and comfort to you all day and night. Heated socks are a great option if you want to make an update of your accessories for outdoor combats and recreational shooting. Optimal performance on the field doesn’t only depend on your rifle and weapon accessories after all. You need to be fully geared from head to toe. Heated socks are not your ordinary clothing piece. These are your specialized socks that offer the warm and comfort you need especially during cold season or when going outdoors. Military combat and other similar outdoor activities require you to be fully geared for the job. Start with an innovative pair of thermal socks. Nordic Gear Lectra Sox. This thermal sock in maroon and black shade is suitable for men and women in various sizes. The pair is made from 17% wool and blended with other high quality fabric materials. It is designed to your feet warm and comfy but not hot. The right temperature is regulated to maintain just the right warmth you need. Warmthru Heated Socks. The modular design of this heated sock makes it practical to use. You can replace all the parts of the socks in a separate manner. It is 100% washable and you can easily remove the heat-element of the socks if you feel like it. It has flexible slides for the heat-element for easy use. Lenz Products Heat Sock. There is a blend of different high quality design and materials in this heated pair. It has Bluetooth remote control so that you have the freedom of wireless connectivity. You can control the heat element through your Smartphone or iPhone. There are 3 heat settings to choose from which could last up to 14 long hours of heat. It shows off the slick and modern design in black with a futuristic aesthetic. 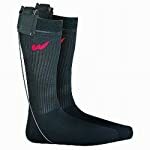 How is the overall performance of the heated sock? There are several ways to gauge the quality and performance of your pair of innovative socks based on how they function. Is the sock working for hours or just for a shorter period of time? Do you get the warmth and comfort you are looking for? These are just few of the important questions you need answered when making a choice among our top 3 choices. Nordic Gear Lectra Sox. This heated pair of socks is an ideal cold-weather piece for outdoor activities. It boasts of its battering-heating technology that allows you to brave the icy cold without having cold feet. The rechargeable batteries could last for hours and when drained, are easy to recharge. Warmthru Heated Socks. The overall performance of this pair of heated socks is quite notable. It is highly recommended for individuals suffering from cold extremities as well as other circulation problems such as Raynauds. The Li-ion batteries with charger could last up to 8 long hours. Lenz Products Heat Sock. 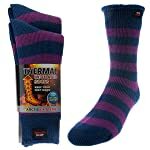 The innovative heated socks provide warmth to your feet especially in extremely cold temperature. There are flexible heat settings which could warm your feet for 14 hours straight. You will surely be on top of your game with your high performance heated socks. 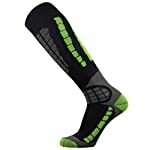 The Nordic Gear Lectra Sox is our cheapest in the bunch. Despite its more affordable price tag, this pair is never inferior when it comes to design and performance. The Warmthru heated socks is our mid-range option and it is also a must-have for your wardrobe. The pair is fully loaded with innovative features. It also works for those grappling with feet problems and circulation difficulties, adding therapeutic benefits to its tab. Lenz heated socks on the other hand is the most expensive in our collection. However, you would not be disappointed with all its advanced designs and performance. Is your pair of heated socks made for heavy duty purposes? Will the heat elements incorporated in the socks still work if they are exposed to extremely cold and harsh environments? Nordic Gear Lectra Sox. This thick and warm heated sock is made from 17% wool materials. It is a great pair that prevents your feet from getting cold and swampy at the same time. The material is resilient and could last for several hours and longer period of use. Warmthru Heated Socks. The bonded materials for this washable heated sock make it super-elastic and warm. It has innovative heat elements with higher capacity batteries for longer hours of use. Lenz Products Heat Sock. The blend of quality materials in this heated sock makes a world of difference. It is made up of 49% polyester, 29% polyamide, 7% polyprpylen, 7% merino, and 5% elasthan. The layers of fabric materials plus the triple heat settings make this pair strong, durable, and reliable for winter sports and other outdoor activities. High performance and high quality thermal socks offer comfort, warmth, and feet protection especially during cold weather. 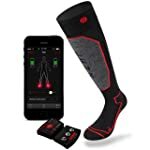 The best heated socks to complete your wardrobe update is the one that yielded satisfactory results, based on the given criteria. 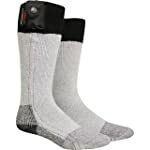 Among the three, Warmthru heated socks gained a commendable score for quality and performance with a reasonable price. You can also read today’s heated socks reviews or find out more about accessories such as scope for 17 hmr, bushnell trs 25, and shoulder holster. I would like to order a pair of Lenz unisex heated socks, do you deliver to Australia. ?